IBM introduces its first personal computer, the IBM PC Model 5150. IBM originally intended this model to be a stop-gap computer that would allow them to quickly tap into the emerging personal computer market while taking the time to develop a “real” PC. It was developed in under a year by a team of 12 with the goal of rapid release to market. Therefore, this team was allowed to work outside of the normal IBM development process and use whatever “off-the-shelf” components allowed for the quickest development. This overriding goal of developing something as quickly as possible had monumental unintended consequences for IBM and the computer industry as a whole that are still being felt to this day. By compromising quality for rapidity, the design of the IBM PC forced software programmers to resort to inelegant methods of software development, hindering the reliability and compatibility of their software. This laid the groundwork for the reputation of the PC as error-prone and frustrating to use. 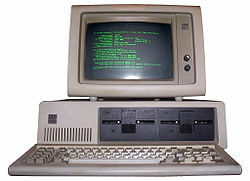 The use of common components and the choice of Microsoft’s DOS as the PC’s operating system allowed other companies to quickly clone the IBM PC. They also allowed Microsoft to license their DOS to other companies, giving Microsoft control of the operating system market. Ultimately these choices lead to IBM’s loss of control of the platform. IBM never did really get a chance to create their “real” PC. And because IBM was the 800-pound gorilla of the business world at the time, the computer that was supposed to be a stop-gap became the overwhelming computing standard, crushing nearly every other emerging platform in the process. Steve Jobs was quoted in a 1985 interview, “If … IBM wins, my personal feeling is that we are going to enter sort of a computer Dark Ages for about 20 years.” While IBM themselves didn’t win, the creation that they lost control of was the clear market winner for approximately the next 20 years. Many will argue that time was in fact a Dark Age for the home computer, but no one could have predicted that on this day in 1981.